chased after the bad guys and made the West a better place to live. 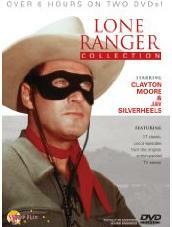 Clayton Moore actually did more than just the TV show. 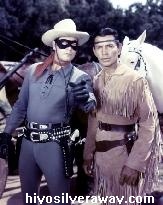 He also starred in two Lone Ranger movies in the mid 1950s. 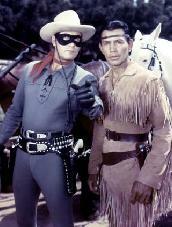 OK - so just what was The Lone Ranger all about? The story of the Lone Ranger. Six Texas Rangers (Hi-Yo! Hi-Yo!) rode in the sun (Hi-Yo! Hi-Yo!). Six men of justice rode into an ambush, with death for all but one. One lone survivor (Hi-Yo! Hi-Yo! ), lay on the trail (Hi-Yo! Hi-Yo!). Found there by Tonto, the brave Indian Tonto, he lived to tell the tale. Hi-Yo, Silver! Hi-Yo, Silver, away! Hi-Yo, Silver! Hi-Yo, Silver, away! His wounds quickly mended (Hi-Yo! Hi-Yo! ), and then in the night (Hi-Yo! Hi-Yo!). Six graves were put there to hide from the outlaws that one man lived to fight. He chose silver bullets (Hi-Yo! Hi-Yo! ), the sign of his name (Hi-Yo! Hi-Yo!). A mask to disguise him, a great silver stallion, and thus began his fame. 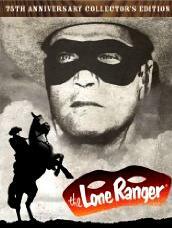 Watch the Lone Ranger Trailer from 1956. HiYa, Kids!! - From Amazon with FREE Super Saver Shipping - $19.99. Bundle with the 40-Episode Collection DVD set of the Howdy Doody show. Never fear Kemo Sabe! 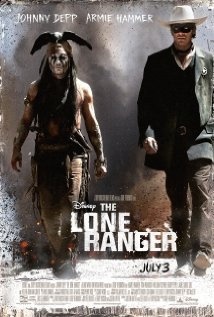 You can find the Lone Ranger eposides on DVD here or get the poster for just $7.99! A fiery horse with the speed of light, a cloud of dust, and a hearty "Hi-yo, Silver! ", The Lone Ranger!